one of the things interactive developers sometimes (especially with new technologies like silverlight, flex, etc.) have to worry about is 'what if the end user doesn't have XYZ installed?' -- something that is likely going to be a question when implementing something so new like silverlight. 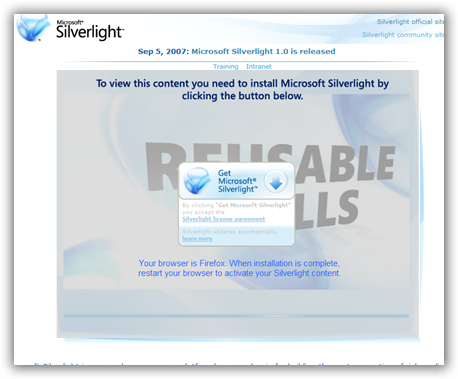 in silverlight, if the user doesn't have the plugin installed, they are presented with a 'get silverlight' badge. it really doesn't explain much about *what* silverlight is, or what they'd be missing (i.e., interactive, rich content) if they don't install it. to me, the default badge doesn't pass the mother-in-law factor test. i first wrote about some ideas when the plugin came out (some of which are not valid anymore given the updated EULA). well, now the product team has come out with a whitepaper on guidance of optimizing the silverlight install experience. the whitepaper (some samples included) documents the various install methods (well, okay 2 install methods) and ways about making the experience to the end user be more seamless, namely ensuring the integrity of your site/brand are kept in tact. one of the really good examples of this that i've seen is the WWE site. if you don't have the plugin installed, they've done a really good job maintaining the integrity of the WWE brand while at the same time explaining the premium content they are trying to deliver and why you would want to install the plugin for their site. the whitepaper explains similar guidance, is about 19 pages and like i mentioned: includes samples. hopefully this will be a good resource to you all. if you are working on a silverlight application, or extending your website to provide a richer experience, you need to be aware of this. i hope this becomes a best practice to all! you can download it here.